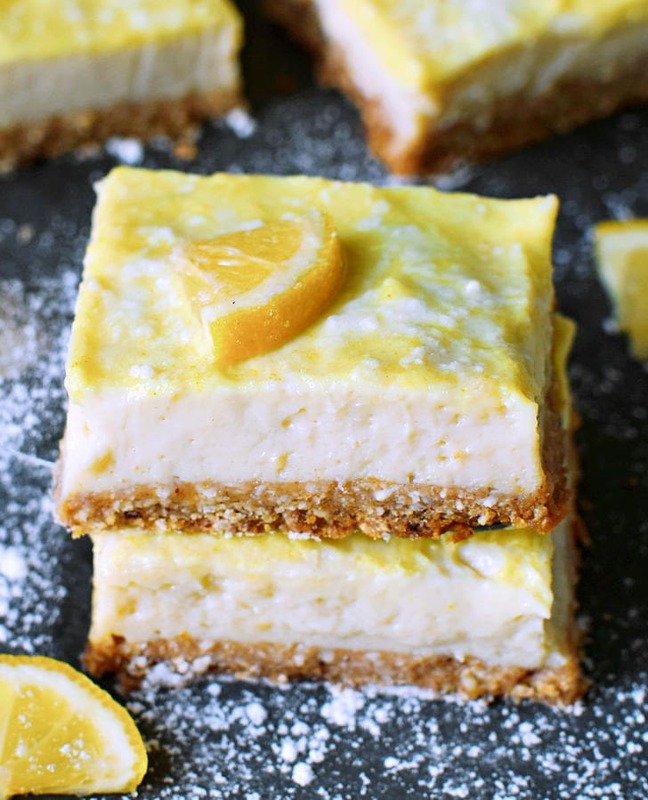 Fresh, creamy, lemony, sweet, sour, and delicious! Oh yes! I am talking about this easy to make dessert which will melt in your mouth! 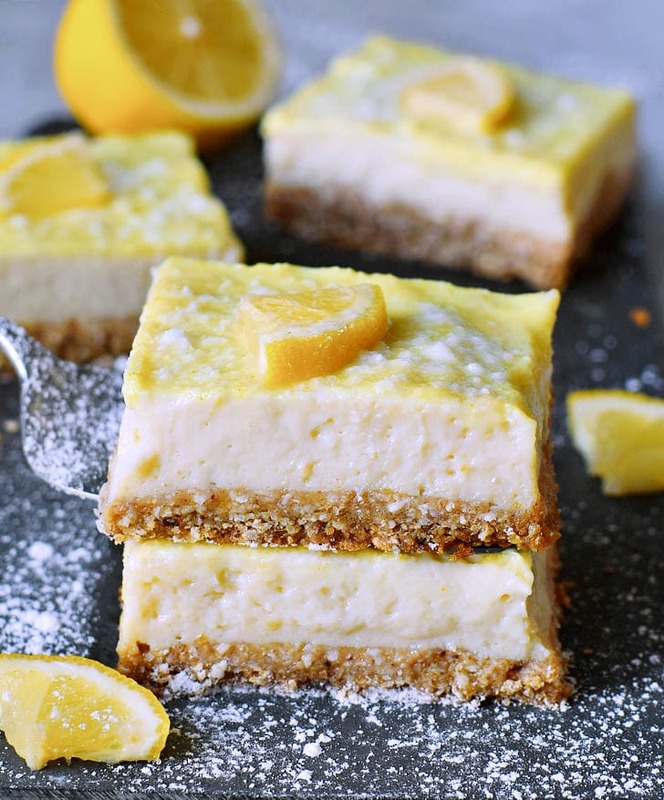 A lemon bars recipe which is not only vegan but also gluten-free. Perfect for every occasion and for every mood. 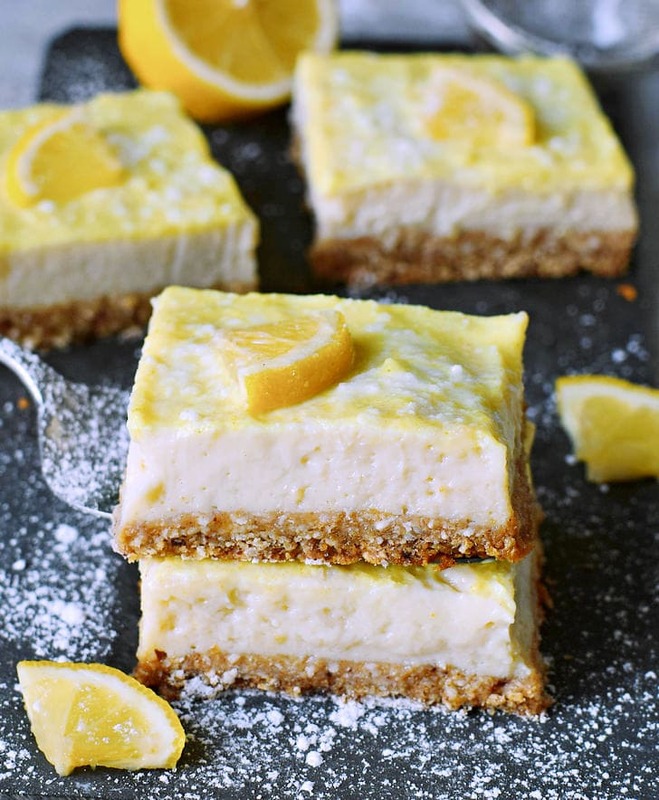 And did I already mention that these cheesecake bars are healthy?! Are you also excited for this mouth-watering dessert?! I hope you are going to love these creamy bars as much as I do. I made the crust with only 6 ingredients, which are oats, shredded unsweetened coconut, dates, plant-based milk, vanilla extract, and a pinch of salt. You can use nuts instead of the coconut flakes. Walnuts, hazelnuts, pecans are just a few examples. However, I really love the combination coconut and lemon, that’s why I used the unsweetened shredded coconut. Another gluten-free option would be sunflower seeds! As you might have noticed, I didn’t use refined sugar in the crust. Instead, I used pitted soft dates! They add a nice sweetness and are much healthier than regular sugar. They also help to hold the crust together which is awesome. The main ingredient of the cheesecake cream is silken tofu. 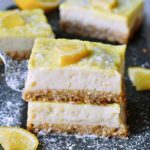 However, don’t worry if you aren’t able to eat soy because you can make this lemon bars recipe completely soy-free. For this, simply use the thick cream of a can of coconut milk. Another possibility would be to use soy-free yogurt (e.g. coconut yogurt) or vegan cream cheese or vegan curd (quark). 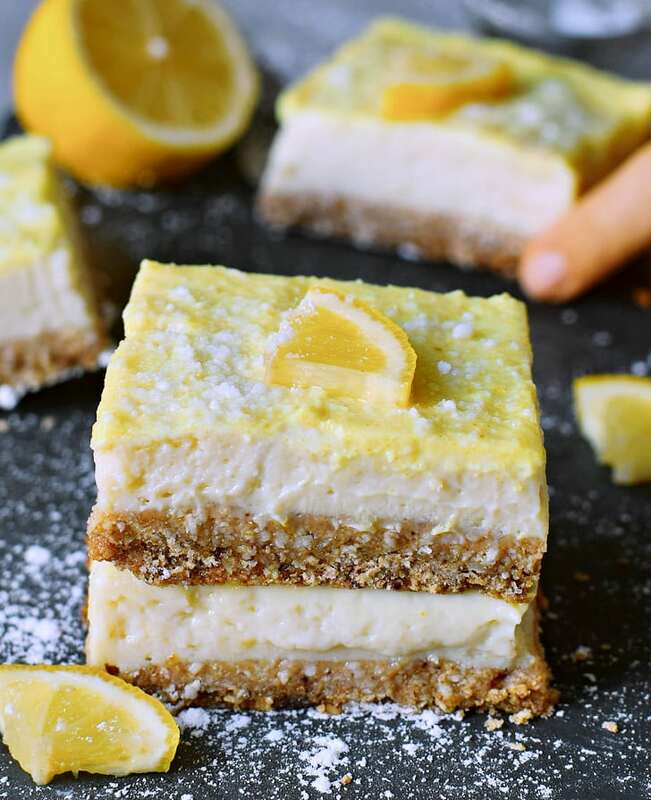 Because silken tofu is thicker than yogurt and coconut cream though, I would suggest also adding 1 cup of soaked cashews otherwise the cheesecake lemon bars will probably be too soft. Check the recipe notes below to find out how to make these soy-free options! As mentioned before, the crust contains oats. You can use gluten-free oats if you have celiac disease. A grain-free option would be, for example, buckwheat groats. I have also made a version with dried mulberries which also tasted fantastic! As you can see, there are many different variations and most of them turn out delicious. This recipe is super easy to make. You probably already have most of the ingredients in your pantry. I’ve used a food processor for this recipe, a blender might work fine as well. 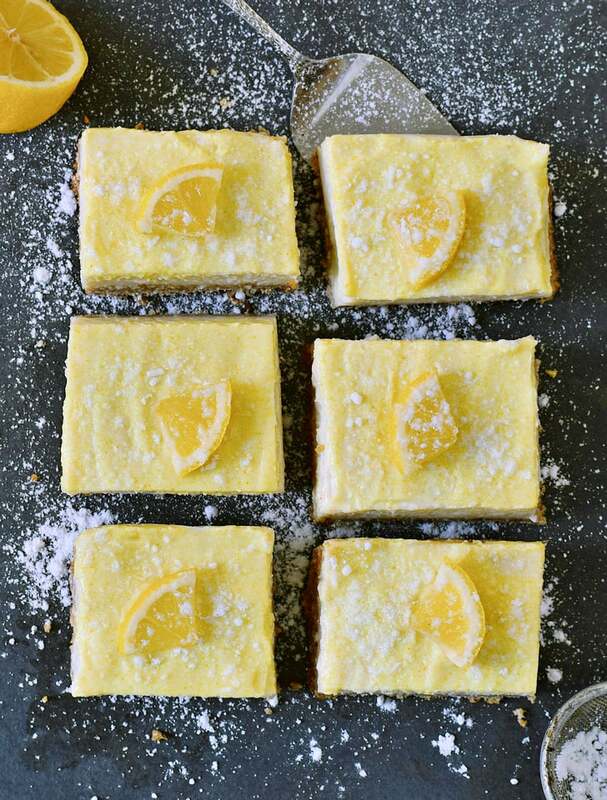 Should you recreate this lemon bars recipe, please leave a comment below and don’t forget to tag me in your Instagram or Facebook post with @elavegan and #elavegan because I love to see your recreations. If you are interested in other creamy desserts, definitely also check out the following ones (click on the names): Baked Vegan Cheesecake, Fruity Cheesecake, Blueberry Cream Pie. 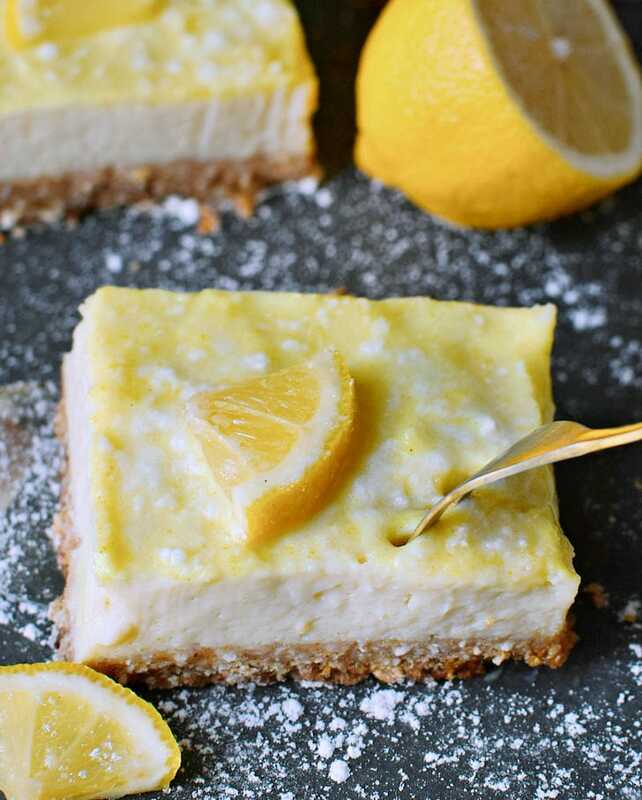 These easy to make vegan lemon bars are so creamy, soft, lush, light, and delicious! The cheesecake recipe is gluten-free, plant-based, healthy and nut-free! To make the crust, process the shredded unsweetened coconut, oats and pinch of salt in a blender or food processor. Add the dates, vanilla extract, and plant-based milk and blend again until you have a crumbly mixture which holds together when you press it between your fingers. Press the crust into a 7x7″ or 8×8″ baking pan lined with parchment paper. To make the filling, blend all the "filling ingredients" in a blender or food processor until very smooth and creamy. Pour the cream on top of the crust. Bake in the oven for about 35-40 minutes (or until the edges appear slightly dry) and let cool. The center will still be wobbly, but that's fine. It's best to put the baking pan into the fridge for a couple of hours to set. The cream will firm up once it cools. Cut into bars and dust with powdered sugar. Enjoy! Store leftovers in the fridge. For a grain-free option use buckwheat groats instead of oats. You can use 65 grams nuts of choice instead of shredded unsweetened coconut. For a soy-free version, use 1 cup of the thick cream of a can of coconut milk (put the unopened can in the fridge overnight, don't shake it, and use only the thick cream, not the water). Another possibility would be to use 1 cup of soy-free yogurt (e.g. coconut yogurt). Because silken tofu is thicker than yogurt and coconut cream though, I would suggest also adding 1 cup of soaked cashews (soak in hot water for an hour, then discard the water) otherwise the lemon bars will be too soft. You could also use 12.3 oz (350 grams) of vegan curd (quark) or vegan cream cheese instead of silken tofu and leave out the 1 cup of soaked cashews! Oh I can’t wait to try this recipe! 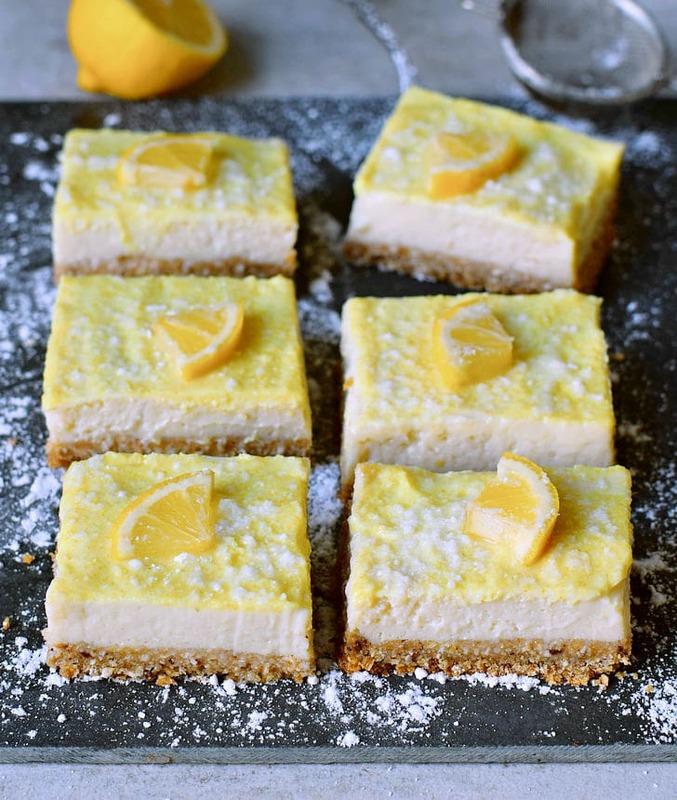 I love lemon so much and since i’m a beginner at plant-based life style due to my health concern i’d love to try this recipe soon, hope i can find lemon in my local market, because I live in a small village in Indonesia where Lemon is quite hard to find ???? Hi there, I love your blog. I am not yet vegan, and barely pass at vegetarian but I am trying to get there. I think your website will really help me with making the changes I need to make. This recipe looks amazing and I would love to try it. However, I can’t have dates. Is there anythung else I could use instead? Thank you and congratulations for your amazing blog! Hey! Thank you so much for your reply. However, I know realise that I wasn’t clear enough in my comment. I can’t have any dried fruit or any fruit that is too seeet (namely raisins, figs, dates, grapes, bananas and other such). I was thinking that I could maybe supplement the oats quantity, sweeten it with some erythritol and maybe use some almond buter or some flax seeds to tie it all together. Do you think it could work like this? Thank you so much! You truly are a Godsent! I will try it as soon as I can and I will let you know! So I managed to try the recipe yesterday and it is a blast! Even my husband who normally only likes sugar filled, traditional desserts was delighted – I could barely keep him away from the cake long enough for it to cool down. I did, however, end up using some milk in the mixture too because mine turned out a bit dry without it. Terrific! Thanks so much for your great feedback, Madalina! Would you mind leaving a rating as well? Sorry, I forgot to rate it – it’s a definite 5 star! For those checking out the comments, I tried the recipe with the coconut milk and the cashews and it turned out AMAZING! Perfect lemon tarts and this is an all time favourite even for my husband who has had numerous recipes of regular gluten, sugary lemon tarts. HI ! Lovely recipes however I tried this one using vegan cream cheese (from violife which is coconut based ) and baking it just completely melted the cream! Don’t understand how baking coconut oil and cream can harden at 180 degrees. Thanks for helping me out as I want to serve your dessert at my cafe ! I only made the recipe with silken tofu (and once with yogurt + cashews), however, the cornstarch helps to thicken the filling. Did it not firm up after cooling?